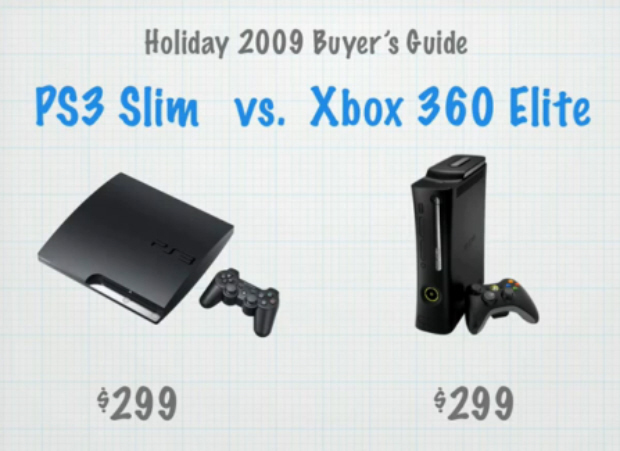 Looking for an Xbox 360 Elite and PS3 Slim comparison buyer’s guide? This page gives a direct system-to-system comparison, where you can see the strengths of both systems when compared to one another. These include the areas of: what you get in the box when you buy the console, what features separate them, what system offers the best movie experience, and how the game libraries of each console stack up to one another. Backwards Compatible with PS1 games but not PS2 games. Backwards Compatible with some Xbox 1 games. Online Play costs $50 dollars a year. No Internet browser. PlayStation 3 includes a Blu-ray Drive for playing movies on Blu-ray disc. The average price for a movie on Blu-ray is about $18.49 per disc. Obviously, depending on what you are buying, a single movie or a box-set/TV Show season, the price will be different. You can also stream movies via Netflix on PS3. This costs $10 per month, but you must request a Netflix disc to stream Netflix movies (the disc has to be in the PS3 drive before you can stream Netflix movies). You can also download and stream tons of movies, TV shows and video from the PlayStation Store that you can purchase and download separate of Netflix. These cost $4.50 on average, but only some video is HD. Unlike the Xbox 360 however, you can choose to not only rent certain video, but you can also buy it and keep it forever. The Xbox 360 includes a DVD drive for watching movies on DVD discs. You can find a lot of movies and box-sets for TV shows and other media on DVD for very cheap nowadays. Xbox 360 does not play Blu-ray discs. You can also stream movies with Netflix for Xbox 360. This costs $9 per month and does not require a disc to stream movies. You can also download video including movies and TV shows from the Xbox Live/Zune Marketplace on Xbox 360 in the video section. Movies bought this way cost on average of $6. However unlike on PS3, you can’t keep any of the movies you download, you can only rent them. Because of the Blu-ray drive and the fact that PS3 also has Netflix, the PS3 has the edge when it comes to HD Movies/Video content. The top-rated existing games for the PS3 that are exclusive include LittleBigPlanet, Metal Gear Solid 4 and Killzone 2. The top-rated existing games for the Xbox 360 include Gears of War 1 & 2 and Halo 3. The highest rated in the top 25 for exclusive PS3 games include: MLB 09 The Show, Ratchet & Clank: Tools of Destruction, Demon’s Souls, Uncharted: Drake’s Fortune and Ninja Gaiden: Sigma. The highest rated in the top 25 for exclusive PS3 games include: Gears of War 2, Mass Effect, Ghost Recon: Advanced Warfighter, Grand Theft Auto 4: The Lost & Damned, Portal: Still Alive, Geometry Wars 2, Forza 2, REZ HD and Left 4 Dead. Big recent/upcoming exclusive games for PS3 include Uncharted 2: Among Thieves, Gran Turismo 5, God of War 3, Final Fantasy XIII and MAG. Big recent/upcoming exclusive games for Xbox 360 include: Halo 3: ODST, Forza 3, Left 4 Dead 2, Mass Effect 2 and Grand Theft Auto 4: The Ballad of Gay Tony. As always, both systems include great games in all genres, great system exclusives, and a lot of features. You really can’t go wrong with either one. However you do want to look at what system most of your friends have if you are planning on doing a lot of online play, and pick the system that will allow you to play online with your friends. You also don’t want to discount online content. Both systems have robust online content with lots of exclusive downloadable games, so you may want to look into what games are available for the Xbox Live Arcade and PlayStation Network before making a decision. The Xbox 360 also has the Avatar system for designing your own online person that you can customize with clothes and accessory that you can buy. You also get exclusive online interactive services like 1 VS 100, a live virtual game show where you can compete for real-life prizes. And although Xbox 360 doesn’t have a web-browser, it does have support for Twitter, Facebook and Last.fm built right in. The PlayStation 3 meanwhile offers you PlayStation Home, an interactive social-focused online world where you can create and customize your own character, and then enter an online space full of virtual worlds based on real-life products and Sony videogames. You can then gather with your friends and chat with them (using a headset or a sold-separately keyboard), play games together in the world, and unlock additional content and items. If you already own a PSP, the PS3 and the PSP can link together and share content to a certain degree, so that my be another factor in your purchasing decision. Both the PS3 and the Xbox 360 also offers ranking systems known as Achievements (for the latter) and Trophies (for the former). These are unlocked when you play games, and can be shared and compared with your friends. This may be another reason why you want to select the system that most of your friends share, so you can compete for bragging rights. Either way, you really can’t go wrong this Christmas with either system. But I hope this buyer’s guide helps you choose the right system for you.